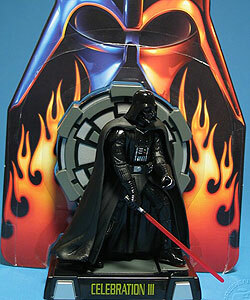 This Darth Vader figure was created especially for Celebration III to celebrate the release of the final episode in the Star Wars saga, Revenge of the Sith. This Exclusive Collectors Edition is limited to 50,000. Comments: Welcome to Star Wars Celebration III! Star Wars fans like you have come together from across the world to revel in the wonder, imagination, adventure, and sheer fun of this epic space fantasy. Star Wars has thrilled fans of all ages for nearly three decades, and will continue to captivate future generations with a timeless story of the forces of good triumphing over the powers of the dark side. We also gather at Celebration III in anticipation of Star Wars: Episode III - Revenge of the Sith, the final film of the saga in which the transformation of Anakin Skywalker into Darth Vader will be revealed. And remember, never underestimate the power of the dark side. May the Force be with you! This figure of Darth Vader is based on the figure from the POTJ 25th Anniversary Final Duel set, although this new version does have a 2005 datestamp. This figure was available during the official Celebration III convention on April 20 -24, 2005. Collectors were limited to one figure per day, and their badge was punched to show proof of purchase. The exclusive clamshell case, designed with special imagery, was sold separately for $3.00 each. The display base for this figure includes a voice chip sound effect recorded from James Earl Jones. 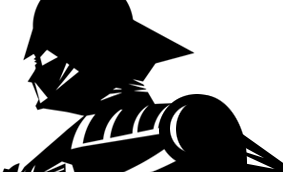 Four different phrases can be heard by repeatedly pressing the button on the bottom right front corner. To listen to the different sounds, click here.